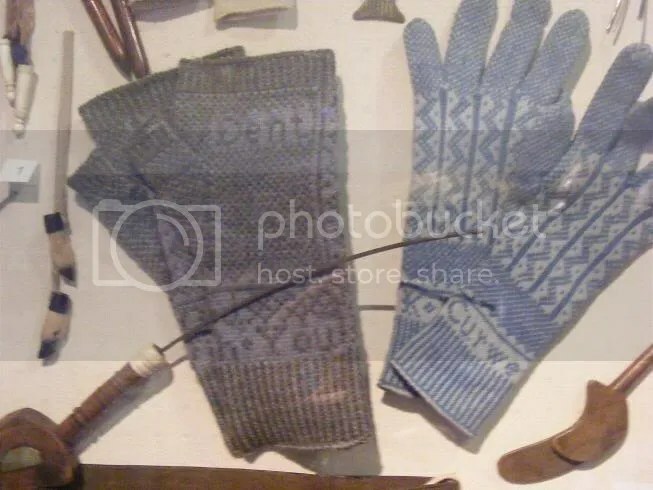 Here follows a chart in PDF form with the alphabet for the ‘Adderback’ gloves which you can see back in one of the January posts..
Here’s some fun I’ve been having with a lightning pattern (right hand side) from a pair of gloves in the Dales Countryside Museum, in Hawes. I call my version ‘Adderbacks’ as they remind me of the zig-zag on adders. I’ve made a slightly less demanding version – hopefully without compromising the various design elements of t’original too much. Hopefully, the pattern will be in an upcoming edition of my favourite UK based knitting magazine – I’ll link (and boast) soon! And as we couldn’t fit the charts for an entire 7 stitch X 7 row alphabet onto the article in a print version, we decided to share them here. It is quite a challenge, making a recognisable alphabet in an area of only 49 stitches. I did use the embroiderer’s alphabet charts in ‘A Schole-House For The Needle’, pub. by Richard Shorleyker in 1632, available from The Mulberry Dyer as inspiration but as I had even less space for rendering the alphabet than the 17thC book had… it was only inspiration. I like the lovely, clean 17thC letter forms. Although I was forced to keep it simple I did manage a few serifs. This is a brilliant facsimilie of an embroidery handbook from 1632. There is an incredible story behind it. Let me share. In the 1940s, a schoolboy, John Mason, found a tatty looking ‘book’ at a jumble sale in Shropshire. Years later, the V & A identified it as a book they held a copy of and that was also in the Bodleian Library. The edition found by the little boy was actually more complete than the other two extant books. The Masons have published a facsimilie. Some of the patterns in Shorelyker can be found on surviving silk embroidered costume of the 17thC. It seems it was in a lot of homes – a bit like a 17thC Mrs Beeton. Shorelyker included both a lower case and an upper case alphabet for embroiderers. These can easily be turned into alphabet charts for knitters.